We continue our series on Houston’s essential dishes with a look at the best chicken fried steak platters in Houston. If you’ve missed any of the previous installments, catch up with the links below. Chicken fried steak is a dish of mythical proportions and looms so large in the state that many just call it “CFS” for short. Few dishes spark such heated debate. Chicken fried steak is essentially a western, ranch-style take on German schnitzel that was adapted to fit the natural Texan proclivity for beef. It also represents the influence that Texas has had on greater southern culture. Just as brisket and beef ribs are essential elements of barbecue canon, chicken fried steak is considered a staple dish of southern cooking. While there are remarkable renditions across the Greater Houston area and its suburbs, there are some that are absolutely essential to try. Some are prepared traditionally, while others opt for more creative expressions. One in this list even applies influences from yet another type of cuisine, which results in a fresh take on chicken fried steak that’s completely eye-opening. Chicken Masala Fried Steak from Himalaya. Photo by Jon Yoo. Chef Ronnie Killen makes a mean chicken fried steak — it is known. So much so, in fact, that variations of the dish are featured prominently at three of his five restaurants. Killen’s Barbecue at 3613 East Broadway in Pearland features a classic CFS incarnation with battered Snake River Farms prime rib eye. It is topped with pork fat-fortified white gravy and served with the diner’s choice of two sides from a list that includes Killen’s signature creamed corn and barbecue beans. Just down the street, at Killen’s Steakhouse at 6425 Broadway, rib eye is replaced by prime sirloin and sides of mashed potatoes and haricot verts (lanky, French-style green beans). While the steakhouse’s CFS dinner is a sophisticated and admirable version of the classic comfort food, the bar serves the fun-size version during happy hour. From 3:30 to close on Mondays and Tuesdays, and 3:30 to 6:30 on the other weekdays, diners can order a $12 cast iron pan filled with Chicken Fried Steak Bites served over french fries. A small gravy boat comes alongside and the bites are made with the same prime sirloin used in the full-sized dish. It’s twice the charm at half the price. Those are in Pearland but there is a Killen’s chicken fried steak in Houston, too — and, again, different than the others. Killen’s STQ at 2231 South Voss serves a chicken-fried prime wagyu rib eye, also sourced from Snake River Farms. The $32 dish puts the emphasis on the steak and raises the bar for a meal traditionally prepared with throw-away rough cuts that have been beaten and battered into semi-tender submission. The Hay Merchant not only serves an essential Houston burger — it also has an essential chicken fried steak. The bar’s menu features both a (totally shareable) half-size or an aptly named “giant” version that weighs in at 21 ounces. 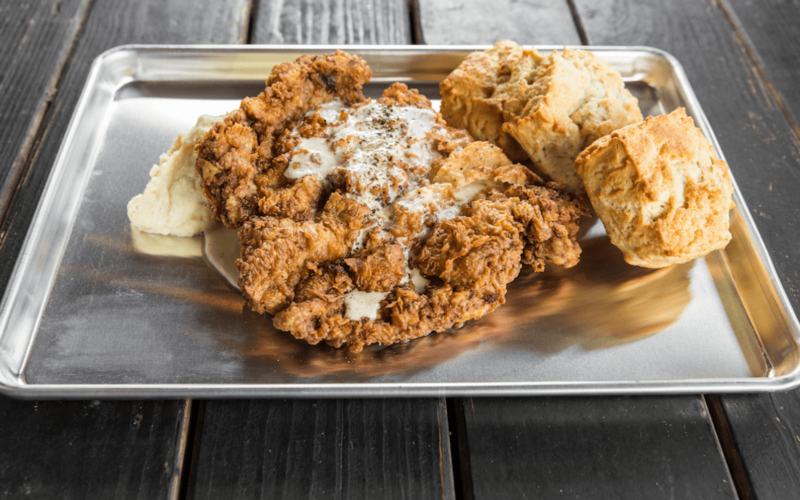 Both feature tender 44 Farms Black Angus sirloin that’s been fried to crunchy perfection, plated over a bed of mashed potatoes, topped with a tub-sized serving of gravy and served with an order of buttery housemade biscuits. A more perfect and traditional version of chicken fried steak is hard to find in this city. 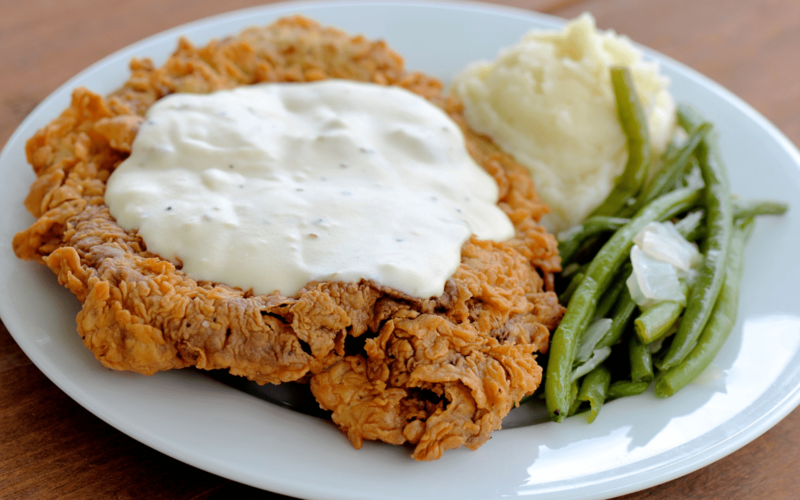 That said, there’s a restaurant that’s been serving a classic Houston chicken-fried steak for much longer than most Houston restaurants and it is the original Hickory Hollow at 8038 Fallbrook. The old school country cafe recently closed its Heights outpost, but its original Fallbrook location, which opened in 1977, has frankly always been the better location in part because of its rustic, authentic, Texan vibe. 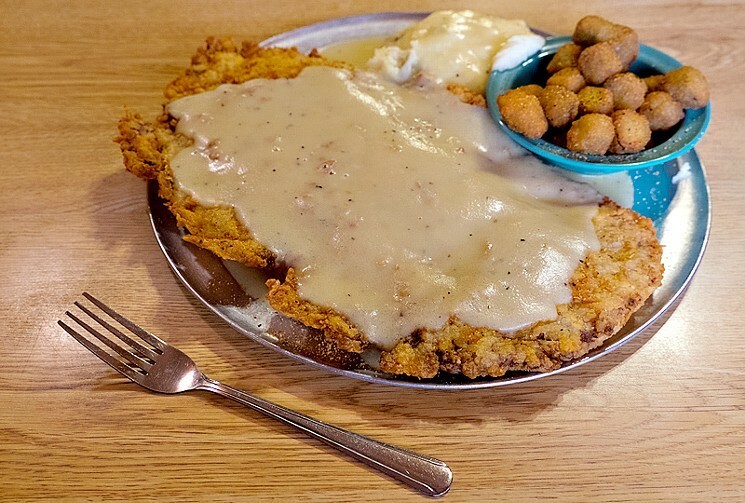 The chicken fried steak has been featured on both the Travel Channel and Food Network and comes in three sizes; the five-ounce Plowman, eight-ounce Hired Hand, or the whopping 10-ounce Rancher. Each comes with a choice of two sides from a selection that includes fried okra, mashed potatoes, mac n’ cheese and the signature “hot tots” — jalapeño potato puffs. Everything about this place screams “Texas roadside cafe” and the recipes haven’t changed in decades. That includes the unusual gravy that Hickory Hollow serves. Among those who closely guard and cherish southern cooking, gravy is a matter of serious debate. While white, cream-based gravy is the traditional accompaniment to chicken fried steak, there are those who prefer the dish with brown, beef gravy. The folks at Hickory Hollow have side-stepped the controversy with an off-white creation named Texas River-Bottom Gravy. While the family recipe is a well-kept secret, we know it is neither beef fat- nor cream-based. We also know it’s one of the kitchen’s most in-demand menu items. Customers often order a second serving with their CFS. While many consider chicken fried steak a southern staple best left untouched, Kaiser Lashkari, the inventive Pakistani chef-owner of Himalaya who is also a James Beard Award semifinalist this year, challenges those preconceived notions. About five years ago, Lashkari started serving a Chicken Masala Fried Steak, his own homage to a traditional chicken fried steak. It marries his native cuisine with the regional influences of the southwest. The southern and Subcontinental fusion dish is anchored by a tender, 48-hour marinated cube steak fried in a rice flour crust. The fried steak is served beside a bowl of curry-gravy made of coconut milk, vegetable oil and a smorgasbord of Indian spices. 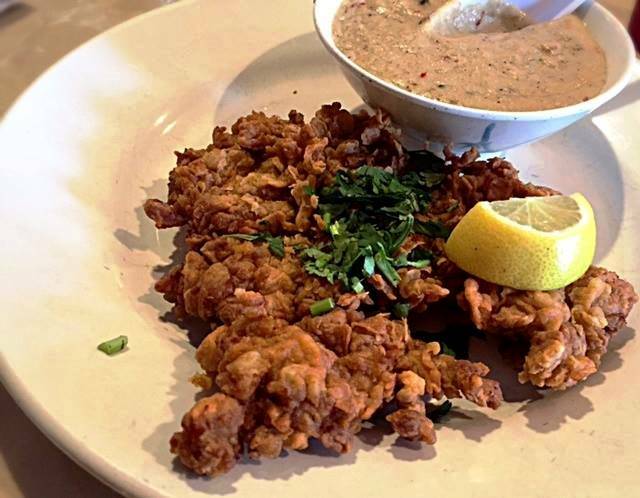 An absolute revelation of both Indian and Texan flavors, the Chicken Masala Fried Steak stands as an endearing reflection of Houston’s dining culture and deeply intertwined demographics. Few dishes in the proverbial Lone Star cookbook offer as much history, blended culture and Texan identity as the eternally beloved chicken fried steak. It’s a dish that connects the state’s “home on the range” rural beginnings with its immigrant-rich backstory. In Houston, chicken fried steak represents both the old and the new. Whether served straight up on a metal plate, fried in Indian spices or rolled into bite-sized morsels, CFS is Houston’s connection to our rural roots and our outlet for modern innovation. In a word, it is essential. Want more chicken fried steak? Check out last year’s list of the best in the city. Your Himalaya photo looks like their fried chicken, not CFS. Thank you SO MUCH for the catch. We placed the correct photo this time! Bring back Strawberry Patch and their amazing CFS.